The original Linkwood distillery was founded in 1821 before whisky production was exactly legal in Scotland. Distilleries were operating all over the Highlands however, and so in 1823 the government released rules and regulations as well as reduced licensing costs in order to control the growing industry. It was in 1825 that Linkwood distilled its first official whisky making it one of the earliest legal distilleries in Scotland. 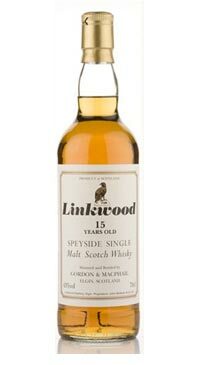 Until recently, Linkwood maintained only one official 12yr bottling that seems to have been discontinued. Most people’s experience with Linkwood will be the many iterations of Johnnie Walker in which it is a crucial component. Many independent bottlers like Gordon MacPhail have taken to releasing single malt expressions of this often under-appreciated whisky. The G&M Linkwood 15yr is brimming with strawberries, toasted cereal grains, vanilla toffee, soda bread, and fruit salad with a long spicy finish. This is an excellent sipping whisky that brings a touch of finesse and elegance to a whisky market dominated by big flavours.